Sometimes you just have to have a little imagination when you are shopping. How cool could that be with a different color, or fabric, or slight alteration? It's no secret that I am obsessed with visiting TJ Maxx, Marshall's, and Home Goods on a weekly basis. My husband knows them as my happy places and never puts up a fight when I ask to stop and roam the isles. I always make sure to roam down the clearance isles in the home decor section because that is where these gems tend to lie. 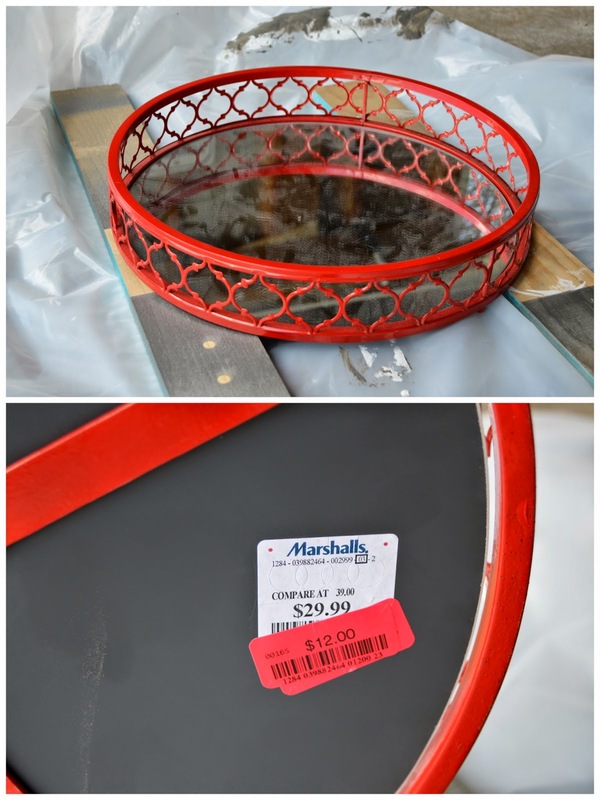 Some of these pieces just aren't to favorable to anyone in their current state, therefore they have hung around for awhile which equals a nice red sticker, aka lower price, like what became this beautiful tray below. Last week we had to make a quick stop at Marshalls, my husband needed to make a return, which meant I got to do some browsing. I found this awesome metal tray, with a mirrored bottom, no cracks or chips, marked down to $12.99. Not only was it marked more than half off, it was a perfect candidate for some spray paint. I've been wanting to try my hand with some gold spray paint and I knew this would be the perfect project for it. Spray paint always adheres well to metal, and if I didn't like it I could just spray it another color since red wasn't going to fly with me anyways. Once I had my tray I made a quick stop at Home Depot for some paint and had the rest of my supplies at home. 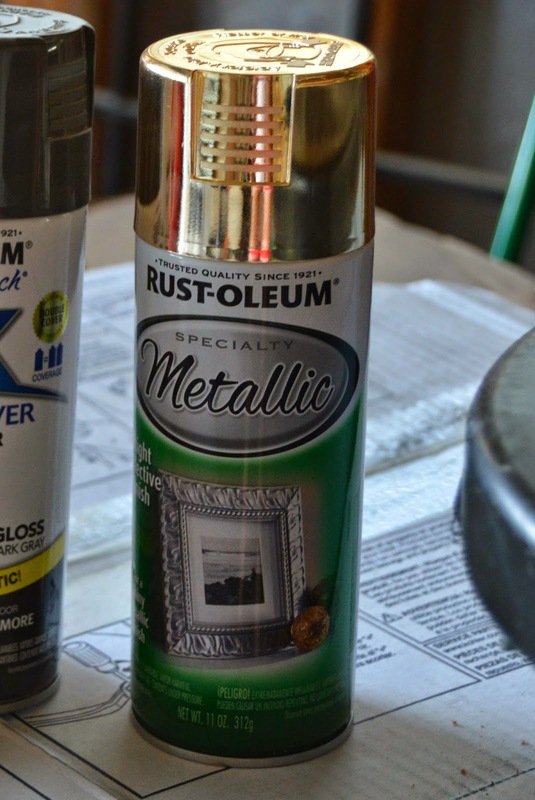 I went with Rustoleum's Metallic in Gold since I've heard good things about it in blog land. The best part about this project is that it can be completed in under a half an hour, it is quick and simple, but gives a big impact. First thing, I grabbed some newspaper out of the recycling bin and using my Frog tape I covered the mirror since I did not want to paint the mirrored bottom. I laid down some plastic in the garage and put my tray up on a few pieces of scrap wood so I would be able to easily coat even the bottom edge and little feet that it has. Always make sure when you are spray painting something that you are doing it in a well ventilated area, not only is it better for you, it also helps the paint to dry. Once everything is prepped, it's go time. Grab your color of choosing and attack with thin, light, even coats. I was in love from first mist. Seriously, I love this stuff. Part of me thinks it's so funny because I used to hate gold, truly hate it. But recently I can't get enough. It's different now though, gold now tends to be this more matted version. It used to seem like it was always this super shiny, yellowy gold. Now it is soft and elegant, so elegant. I can assure you that this spray paint will be well used by me, just watch. I'm not sure yet exactly where this tray will call home. Right now it's living on the sideboard in my office housing my nail polish. Not sure if it will stay but, but what is for sure is how much I love it! Cute tray and I love the idea of gold spray paint!! 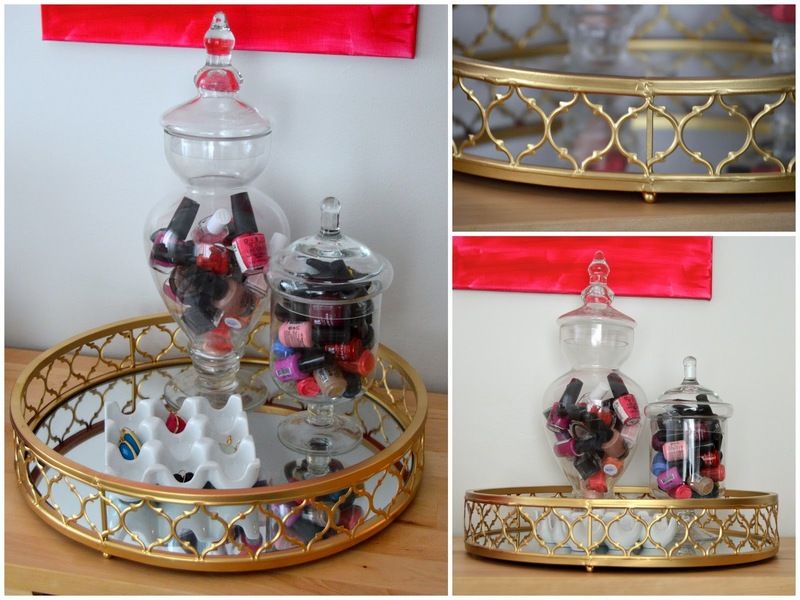 I am 100% obsessed with this DIY. What a great tray find and even better with gold spray paint! Gold really does make everything look better these days. Thanks for sharing! Impressive! It turned out perfect! I never would have thought to do that...can you just lend me some of your creativity...please?!!? Absolutely gorgeous girl! I love the clearance aisle at TJMaxx I always find the best gems there. I will have to keep that spray paint in mind it came out beautifully! Doesn't it?! I think I'm obsessed! It's seriously amazing, I'm almost sad I didn't discover it till now! Thanks! I may be turning many things gold in my near future! LOVE IT! Don't you just love the steals at Marshall's? Love how you changed it up and made the tray even more beautiful. Thanks for linking up to What You Wish Wednesday.